Denison, Ia. 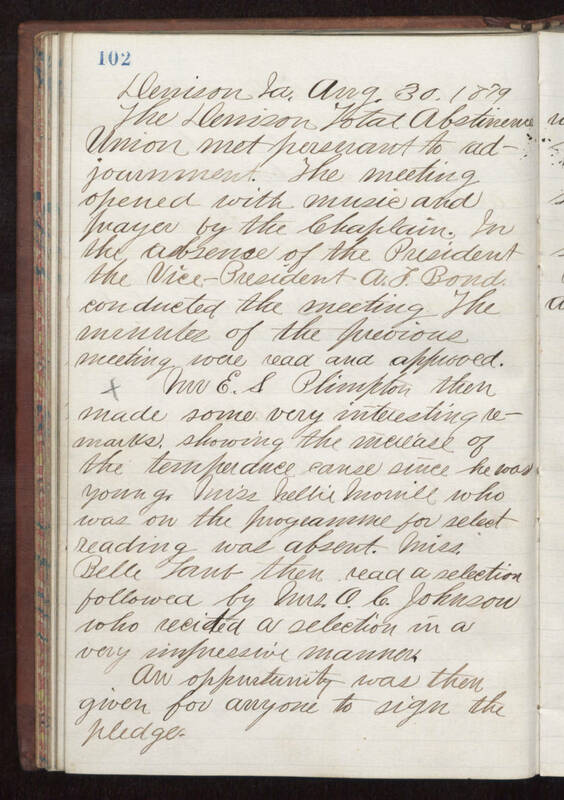 Aug. 30, 1879 The Denison Total Abstinence Union met persuant to adjournment. The meeting opened with music and prayer by the Chaplain. In the absense of the President the Vice-President A. [L?] Bond conducted the meeting. The minutes of teh previous meeting were read and approved. Mr. E.S. Plimpton then made some very interesting remarks, showing the [meilase?] of the temperance cause sine he was young. Miss Kellie Morrill who was on the programme for select reading was absent. Miss Belle Lamb then read a selection followed by Mrs. O.C. Johnson who recited a selection in a very impressive manner. An opportunity was then given for anyone to sign the pledge.